Geoff ‘Joffa’ Thompson’s 100% Langhorne Creek Shiraz Cab Malbec returns and has been blended to perfection. Showing a brightness and brooding complexity this wine displays a lovely elegance and generous mouthfeel - perfect for the cooler months. From the first pour you’ll be mesmerised by deep red purple hues, delightful aromas of plums, blueberries and black olives and beautifully soft, velvety tannins. Geoff has done everything to let the fruit shine: from harvesting in the cool of the night, maturing in American and French oak and then expertly blended to create this beautifully balanced wine. 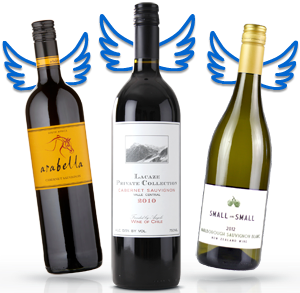 Sorry, this wine is available exclusively to the Angels who helped make it happen. To find out more about becoming an Angel, click here. It's hard to beat treating yourself with a local red as you settle in for the evening. It's tougher yet to beat Ash's latest instalment of Shiraz Viognier - his treat for Angels straight from the Top Shelf! To top it all off, this single family vineyard stunner is certified organic. Each glass you pour will spill out aromas of lavender, oak spices and blueberries. The palate will send you into a spin with layers of sweet plums, raspberry and delightful savoury tannins to round it all out! Hand picked by Ash's team in the Upper Hunter Valley, he used whole berries and French Oak to maximise the potential of each gorgeous berry. Co-fermenting the Shiraz and Viognier varietals together integrated tannins and flavours as smoothly as possible. There was very limited production of this historically popular wine, so stock up today and then pop a couple in the cellar ready for winter! by Glen Robert & Andrew Scott . Are you ready to bring something completely different to the table?! This rich, ripe and generous Shiraz is full of jammy black fruit with blood plums and blackberries and is a stunning step away from the typical 'bowl-me-over' style of Shiraz that dominates the Australian market. Hand-picked, hand-crafted and hand-bottled (right down to the hand-dipped wax seal) you simply don't often find wines made like this. The true meaning of 'La Petite Mort' is about enjoyment - letting go of restraints and revelling in something new and maybe a little titillating. Made in tiny quantities, this vintage marks the return of a champion (93% rated!) - it won't stick around long. by Nigel Dolan & Caroline Dunn . Ever since launch day two years ago, Dolan & Dunn’s sublime red has sold out in a flash. Now, one of the most eagerly anticipated wines returns to the Naked shelves exclusively for Angels. You simply cannot get a more experienced or powerful Australian winemaking team than this. At all. Anywhere! This elegant, robust, delicious wine has Barossa character and richness stamped all over it. Gear up for a plush, luscious palate with hints of loganberry, mulberry, blackberry and a touch of cherry and fennel-seed spiciness. Juicy fruit mingles with subtle oak driving to a finish that lasts and lasts… pick that chin up off the floor! Under $19 for this deliciousness is an Angel-only privilege. Caroline and Nigel have over 60 years of brilliant Barossa winemaking experience between them and, extraordinarily, had never made a wine together...until NOW! Each parcel of grapes is soaked, fermented and pumped separately to maximise its unique character, then blended just prior to bottling. This is the moment when months of preparation pull together, showing a lovely deep maroon colour and combining aromas of ripe berries, plums and a touch of spice. The palate is full and flavoursome with the extra kick from the Durif, with lovely balance and great length. This is a wine that truly punches above its weight, and at a juicy bargain for Angels it's a must in the next case for any red lover. Get in quick and don't miss the chance to let your hair down like a good red head! Liz's skilful blend of these two grapes has kept Angels coming back for more every vintage release! This is the latest instalment of her Shiraz Viognier, and it's a knock-out in the flavour and value department! Your palate will be treated with approachable plum and white peppercorn notes with a delicate floral note contributed by the portion of carefully blended Viognier. The finish has velvety hints of mocha and spice. These supple layers will linger & provide a real treat for those who love to enjoy a glass of red with any hearty red meat based meal. With each vintage being snapped up by Angels who have long enjoyed Liz's wines, why not double up on this wonderful red before it's too late! At under $9 per bottle for Angels, this is a stunner not to be missed in your next Naked order. A blend of Shiraz, Cabernet and Malbec, this is a truly rich wine with blackberry, plum and cherry fruit on the nose supported by a soft and rich palate with firm tannins. It's an undeniable crowd pleaser! Top Shelf class for under $18 and with a huge Angel following from past vintages, there is no doubt this will have you smiling from ear to ear. Adam has pumped up every element using top quality fruit so that you can enjoy full flavour, balanced texture and have your guests asking where/what/how??! Another cracking star in Adam's line-up of reds that champion different winemaking regions of South Australia, this is likely to top any red lover's list of go-to classics! This medium bodied red packs plenty of flavour! Blackberries and red cherries will coat your palate, followed by hints of spice. Each element of this easy drinking red sings in perfect harmony. Hard work and passion have been at the forefront of creating this classic Aussie blend. 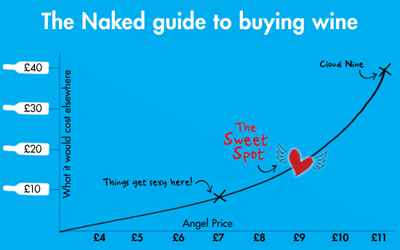 This would retail a lot higher in a bricks and morter store, so snap up this bargain reward for all your Angel support! Racking up a huge Angel buy-again rating of 90%, the return of this favourite has been a long time coming. Take your fill!